We just finished these 2014 printed mousepads for ProQual Landscaping in Tempe AZ. ProQual is a commercial landscape company that specializes in landscape maintenance, turf management and tree care for neighborhoods and communities valleywide! Their attention to detail and personal customer care make them a great choice for any Phoenix area community or commercial complex. We are much more than offset or digital printing, Tower Media Group provides custom mouse pads in a variety of sizes, materials and thicknesses for all sorts of businesses. Mouse pads continue to be a great way to promote your business and products. They are in front of your customer all day, every day… you just can't beat that kind of brand exposure! There are very few promotional items that get viewed as often as mouse pads, post-it notes or pens. Tower Media can print your logo on any of these items and man, many more. You can visit our online promotional product portal to get an idea of all the branded ad specialty products we have available. Why choose Tower Media? It's simple… We provide hands-on customer service and over 150 years of combined experience in the design, printing and advertising industries. Sure… you might save a few bucks by ordering from a cheap online supplier. But it's a huge gamble on whether or not your product will turn out as expected. The few dollars you might save will evaporate quickly if you have to print the items twice because of a mistake, or if you end up with sub-standard product. Ordering printing online has a way of turning from "initial price" to "eventual cost very" quickly! The temptation to save money is very real for everyone… but sometimes it just isn't worth the risk! Now days, there are numerous online printers selling at wholesale, or even below wholesale prices directly to the consumer. Sometimes the saving seems too good to be true… and as with other aspects of life, it usually is. 1) How do they do it for so cheap? The answer is simple. They run multiple project together on very large press sheets and then trim them apart for distribution. Most online printers run anywhere between eight and sixteen brochures together on one sheet, where color and other adjustment cannot be fine tuned to your project. They just set the equipment at default and let it rip! That's why we see so many brochures these days with horrible color, especially in the flesh tones of faces and skin. 2) Why are there so many errors in layout? Unfortunately, online printers do not trouble shoot each project or even have a print-planning phase. they simply drop the submitted electronic file into place and it's all automated from there. If the layout, margins etc. are out of whack, it just prints, trims, folds and ships! Here's the bad news… these errors are 90% the fault of the person designing the piece and/or submitting the print files. Without the eye of a trained design and/or printing professional, these mistakes ALL just slip through undetected. An automated system simply can't check for these things, so you just have to cross your fingers and hope it comes out right. 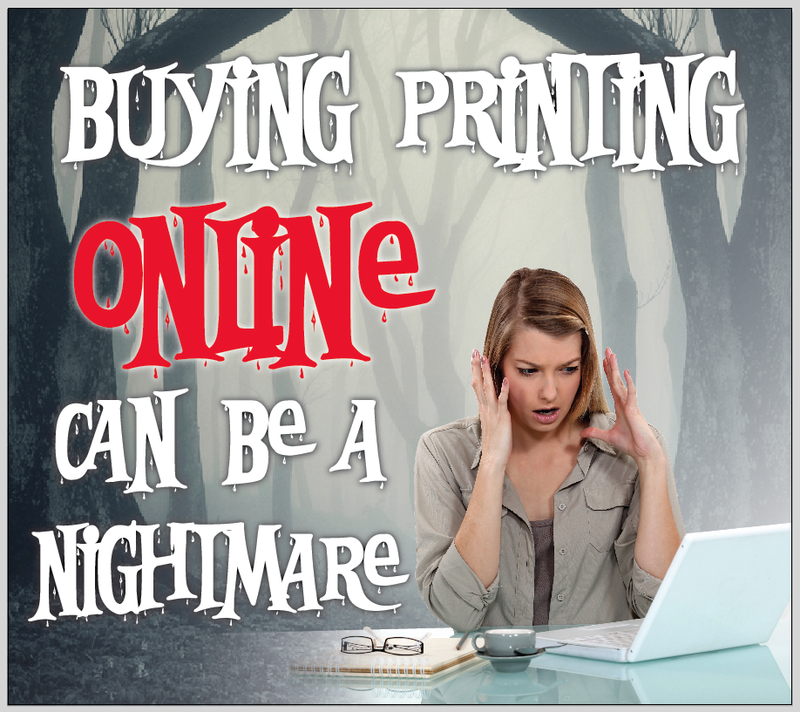 Here's a good rule of thumb… if you aren't saving at least 50% by ordering printing online, THEN DON'T! Because you'll very likely end up having to pay for it twice. 3) Why do I have to pay for the reprint if my project turns out wrong? Unfortunately, you really have no recourse. These companies are operating at very low margins in order to sell printing so cheap. They very rarely, if ever, will assume any responsibility for errors or reprint expenses. It's a simple formula; if you send a "print-ready" file, you are responsible for it. Again… the system is automated and they simply don't look at the work - just run, trim, fold, ship. They print what you give them... this is their stance. 4) Are there hidden expenses? It depends on the company, some of them are fairly straightforward. But be careful to ask all questions before ordering. 6) Who really does the printing? It depends, some online printing companies actually have printing facilities and run the work in-house. But I have seen cartons of printing from all over the world, and a lot are from Korea and China. The last business card box I saw from Vistaprint said "Printed in Canada" right on it. If supporting the American economy and local businesses are important to you… use a local printing company! 7) How can the quality be any good at such cheap prices? Believe it or not… we have seen some really nice projects come from online print sources. They are usually the ones that have been handled by a professional graphic designers or print broker, so the know how to trouble-shoot the files before sending them to print. But for the most part… the quality is pretty poor. Partly because of the gang-run factor and partly because honestly… run and ship color business cards for only $10? Ordering from these places is just a great way to give them unlimited access to your email account so they can SPAM you into oblivion for the rest of your life! Here's the bottom line: There is simply no substitute for creating a solid, personal relationship with a professional graphic design and printing firm. They will take care of you and your brand. It amazes me how concerned most people are with their personal appearance. How they groom, how they dress, what they drive… means everything! But then they don't care at all how their company looks? ?